Because I had fun drawing that platypus yesterday. i just love the platypus! though i never actually saw one alive! i had , and still have, a toy one at home, my favourite!!! 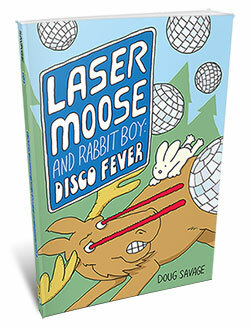 i like the laser shooting eyes! They also make good secret agents. “Zen like concentration”… so funny it hurts! “Platypii” is hypercorrection. The plural is “platypuses” or, if you want to use an “authentic” form, it should be “platypodes”. Don’t forget the venom. That’s a platypus exclusive. Came here to say this. I can’t believe you left it out! When I was in middle school we each had to do a presentation on an animal of our choice for science class. I chose the platypus, and had the most interesting presentation by far. They’re just so freaking weird. Hunh – I always thought it was venomous stare and spur-mounted lasers. Got that backwards; darn you Uncyclopedia!! I had to google ogden nash, platypus; some long ago memory stirring in my brain. Sure enough, “The Platypus” by Ogden Nash. I wasn’t crazy; rather, parts of my mind still function! HAGD! Not only are those claws sharp, thery’re also venomous! I didn’t know platipii, platipuses, platipusies, shot lasers from eyes? Maybe it poops like a rabbit, too. Yes, I second the venom. Don’t forget about the articulating poisonous spurs. Platypus’s are like little KGB agents. How darling. Now I hope we get to see a new series and new website , SavagePlatypus.com !!! i knew they were hiding something! now i know its the lasers! Give it a cape and it could fly. Look! Up in the sky! It’s a duck! It’s a beaver! 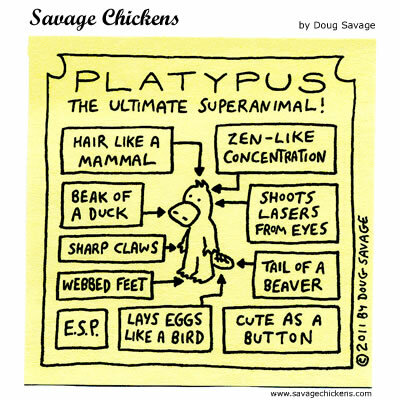 No it’s super platypus! I love that platypii are venomous. It’s like they weren’t weird enough without it. It reminds me of a quiz Defective Yeti had on his website: What Venomous Egg-Laying Mammal Are You? Platypuses and ducks have bills, not beaks. Ilkka beat me to it, but yes, the male platypus is the only venomous mammal: they have spurs on their hind legs. There are others actually, but it is a very small club. You forgot the poisonous barbs on it’s ankles, which the males use during mating and contain over 80 toxins. How could you forget the poisonous barbs on his feet??! ESP? That explains how Platy knew I was taking him to the vet to have his laser eyes fixed. Also the ESP is probably in reference to their sense of electroreception – they can feel electrical currents being generated by their prey’s muscle contractions. Very cool. Not ESP though. No, the ESP is a reference to their uncanny fortune-telling skills. I am madly in love with your platypus cartoons! And they are venomous too! They have a crazy venom (delivered by a spike on their leg) that while non-lethal, cause hypersensitivity to pain (a paper cut feels like an amputation) and even morphine doesn’t help. I love the platypus! Aaaah, the Chuck Norris of the animal world (with in-built spurs), I used to save them from fishing nets as a kid, you don’t see many nowadays. He forgot the poisonous part. Oh well, MOST of us appreciated the cartoon for its face-value as well as underlying humour. I would get one,but to protect myself from lasers it would be $100,000 a second and that’s 50% off! Maybe I could get the lasers removed. are you making a t-shirt or mug out of this? it’s awesome.